Bluetooth Headphones – A friend of my husband’s, who is a fellow triathlete, recently recommended these to him and after using them once for a run, he said he couldn’t believe he never found these before. In short, he loves that they don’t hang around his neck and rub when he runs. Coffee Shop Gift Card – If you’re like the triathletes in our town, there’s a coffee shop/deli where they all congregate before and after riding. They all grab coffee or a bagel while discussing life and okay, mostly racing. 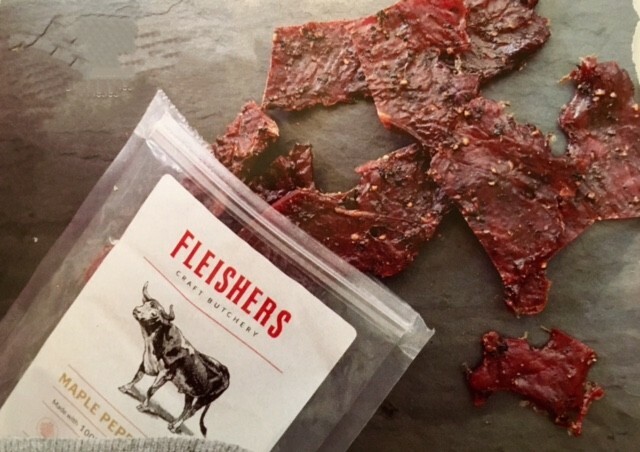 Housemade Beef Jerky Subscription – Unless they’re vegetarian, most triathletes probably love jerky and Fleisher’s Craft Butchery has to have some of the best around. Right now, you can get 25% off and free shipping on a 3 month subscription. The jerky is from grass-fed, pasture and humanely raised beef and is organic with no hormones, no antibiotics, and no MSG. Photo credit Flesher’s Craft Butchery. Fujifilm Instax Mini 8 Instant Film Camera – Well, this might be a gift for the triathlete supporter, too, but it’s just a fun camera. Besides, it’s really great with small kids. A Favorite Taboo – Triathletes tend to give up a lot to be triathletes and train and race. I know I don’t have the discipline, but they somehow seem to muster it up for the love of the sport. But, with it being “off season”, perhaps they deserve a splurge and are in need of a training break to partake in a favorite vice they have forsaken. Whether we’re talking a bottle of scotch (my triathlete’s taboo) or a favorite cigar, you know what that might be. 2016 Holiday Box From RunnerBox – This company offers a bimonthly subscription filled with products specialized for triathletes called the TriBox that costs $20 every other month, shipped right to your front door. The products range from energy bars, gels, chews, to many accessories. But, you can just get the holiday box that’s filled with seasonal fuel and treats and a few accessories to keep your triathlete on the go. RUNNERBOX Holiday Gift Box 2016. Photo credit RUNNERBOX. Schwinn Bicycle Water Bottles – I don’t think any explanation is needed here. You can just never have enough water bottles, because you should be dumping them on a routine basis. When mold starts to grow in there, you know it’s passed its shelf life! Plus, this one comes with a cage just for a bike. Vbiger Winter Cycling Gloves – We all live in cold climates, so this is a must have for our triathlete. Plus, they’re made for use with cell phones with the touch screen tips. Toaster Grilled Cheese Bags – This is a great way that they can fix fast grilled cheese sandwiches or even heat up a piece of pizza ON THEIR OWN. These bags are teflon coated and so easy to use. Great for your little kids, too! Swim, Bike, Run – Eat – If you can’t afford or don’t want to spend the money on a nutrition consultant, but still need some help with fueling advice, this book is a really good option. It’s called the definitive book for fueling your triathlon, so it’s chocked full of good information. 2 Toms Complete Gift Box – The Complete Gift Box from 2Toms was made with the triwife/partner in mind. It is filled with products to help banish foul smelling odors and eliminate or greatly minimize the friction that causes blisters, chafing, and irritation. It containes 2Toms’ top-selling items used by triathletes and runners. Donation – And don’t forget it’s always a great idea to make a donation in your triathlete’s name to the charity of their choice. We always complain they have too much stuff, so why not break the cycle?! There are also many charity’s that are triathlete related, so you can stay in the spirit. What are some under $100 triathlete holiday gifts you’re giving this year?